If the grey London evenings are getting you down, head down to the Novello Theatre and take a trip to sunny Greece with Mamma Mia! Catherine Johnson, Benny Andersson and Björn Ulvaeus’ irresistible jukebox musical hit. The sunny West End staple, which has been running for 20 years on the West End, has most definitely reached icon status, inspiring two movies, and countless international productions around the world. And it’s easy to see why. Mamma Mia! is an easy musical to love. The fun and fairly lightweight plot is bursting with ABBA bangers, and the cast certainly revels in the musical’s over the top energy and zest. From wetsuit clad groomsmen dancing in synchronicity to Lay All Your Love On Me, to a neon hazed dream sequence accompanied by the cool synthy Under Attack, Mamma Mia! is certainly not short on zany musical numbers, choreographed for peak dancefloor copycattery by Anthony Van Laast. Does Your Mother Know That You’re Out is a vivacious highlight, and the musical’s concert-like finale seals the deal, ensuring that the audience leaves on a high. At 20 years old, Mamma Mia! is one of the oldest musicals on the West End, and at times it does show its age. Mark Thompson’s Ionian blue and white set design perfectly evokes Grecian summer on the fictional island of Kalokairi but looks a bit washed out. The glaringly 90s costumes however are delightful and add massively to the musical’s overall nostalgia factor. This is a musical which shows no sign of slowing down. At this point it’s basically part of the fabric of London’s West End; a delight from start to finish. Seen it before? (Here we) go again! This year, 10 years after it opened on Broadway, Dolly Parton and Patricia Resnick’s 9 to 5 the Musical has finally made it to the West End. Based on the 1980 film of the same name, it tells the story of Violet, Doralee and Judy, three exasperated colleagues who join forces to try and banish sexism from their office. Patricia Resnick’s book offers plenty of laughs, but also addresses, amongst other things, the gender pay gap, workplace harassment, and the bias against working mothers. All of which are issues which continue to make headlines today. 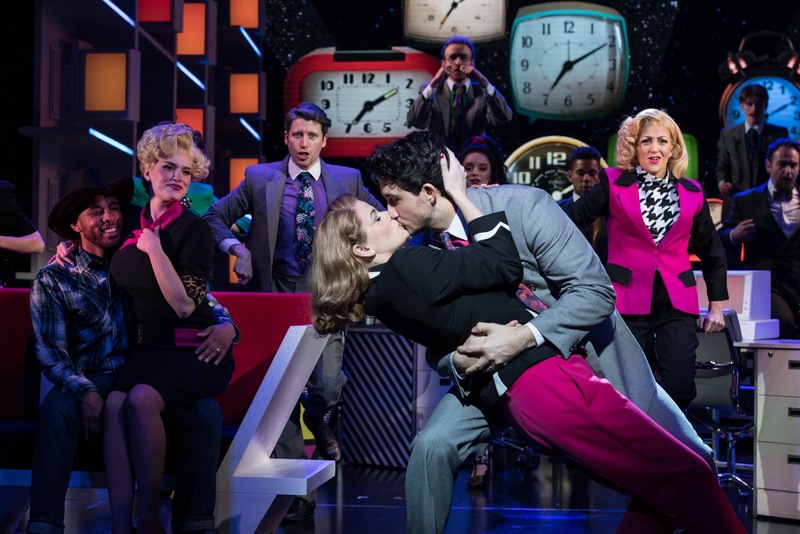 The script’s puerile humour won’t be for everyone, but 9 to 5 the Musical certainly has its moments. It also, obviously, puts its female stars front and centre, and wisely so as they are undoubtedly 9 to 5 the Musical’s strongest asset. Amber Davies is sweet as young soon-to-be divorcee Judy, showing up for her first day of work looking like a child who raided her mother’s wardrobe, and with the naivety to match. She starts off unassuming, but ends up lifting the roof off the Savoy Theatre with Get Out and Stay Out, an empowering up tempo war cry which Judy delivers to her skeevy ex-husband. Natalie McQueen is just as tremendous as Doralee, a “Backwoods Barbie” who has to prove that there’s more to her than meets the eye after facing relentless hostility from her female co-workers as well as relentless sexual abuse at the hands of Brian Conley’s lascivious CEO Franklin Hart Jr (Perfectly slimy and extremely gravelly voiced, so much so that at times he’s barely comprehendible). Bold, brassy, and hysterically funny, McQueen’s Doralee is a total scene stealer. 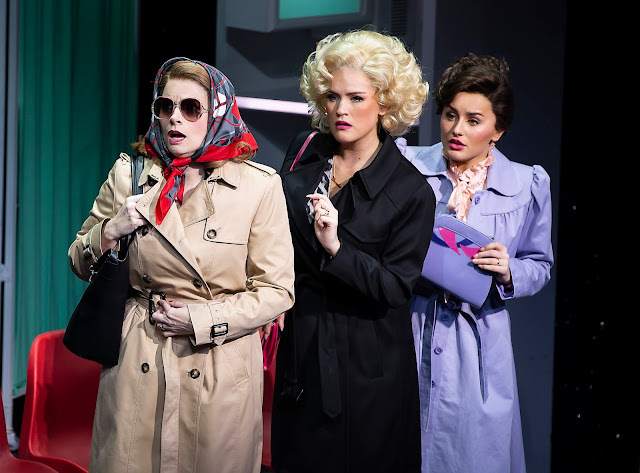 Caroline Sheen completes 9 to 5 the Musical’s central power-trio as Violet, a strung out yet assertive single mother trying to make it to the top in her male dominated workplace. Her budding romance with a younger male colleague may not be the most compelling side plot, but she’s otherwise a fantastically well-rounded and dimensional heroine, and foil to the inimitable Bonnie Langford’s waspish Roz Keith. The production is bolstered by comically 80s production design. 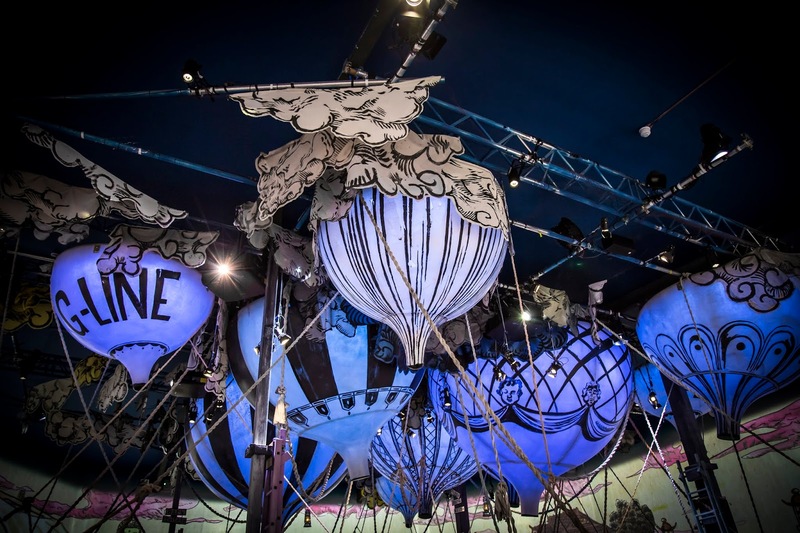 The set which is bright and visually appealing, if a little bit sparse on the Savoy Theatre’s deep stage, with roll-on set pieces which betray the production’s past life on tour but are otherwise perfectly functional. Video design by Nina Dunn is sleek and vibrant, and while a Dolly Parton video cameo is evidently shoehorned in where it isn’t necessarily needed, having her pop up to sing a little bit of the title song is an undeniably upbeat crowd-pleasing moment. It may not be the most robust or profound musical on the West End right now, but 9 to 5 the Musical offers a huge dose of girl power, which is sorely needed in 2019. To coincide with International Women’s Day, West End Live Lounge presented WOMAN; a powerful celebration of women in the world of music. Featuring an eclectic song list ranging from evergreen musical sensations like Carole King, to modern day chart toppers such as Little Mix, there was definitely something for everyone to enjoy. 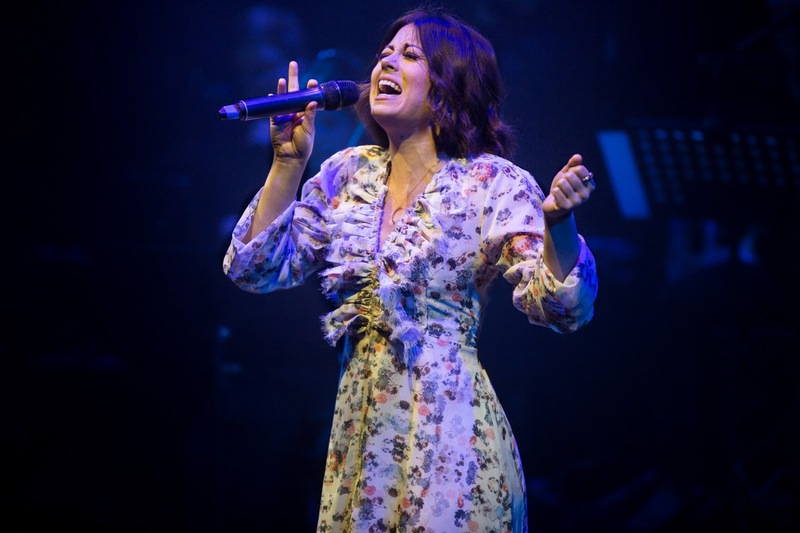 West End Live Lounge creator Shaun McCourt assembled a line-up of talent that could any musical theatre fan’s attention, featuring headliners Louise Dearman and Emma Hatton alongside a whole host of outstanding vocalists. Accompanied by the Live Lounge Band under the musical direction of Sam Coates, the performances were invariably jawdropping, with highlights included recent Bat Out Of Hell alumnus Simon Gordon’s rendition of Lady Gaga’s Oscar winning Shallow and Jennifer Tierney's performance of All By Myself which began as a beautiful yet unassuming ballad before building to a face-melting finale. Finally, sensational vocal trio Divalution’s rendition of Little Mix jam Power ensured that the concert ended on the highest of a high notes! It may have been nice to hear more mainstream female pop offerings, as a number of iconic 00s performers were notably omitted, but with the runtime pushing 3 hours already, and a set list which kept audiences guessing from start to finish, a follow-up concert ought to be considered in order to squeeze in the likes of Rhianna, Lily Allen and Beyoncé. Presented by the indomitable affable Samuel J Holmes, whose panto inspired patter kept the concert running slickly, West End Live Lounge’s latest offering was a resounding Sunday evening success. At 4pm on an unusually sunny February day, I receive a clandestine text message. Its contents is fairly cryptic; just the name of a tube station and a set of walking instructions to guide me towards the location of my fast approaching evening adventure. Gingerline’s latest immersive dining venture The Grand Expedition is shrouded in secrecy, but when I arrive at a rather shady looking carpark with a tentative friend in tow, I know immediately that we’ve come to the right place. We’re met by a small gathering of equally clueless fellow ticketholders, who are slowly but surely being ferried in to an unassuming warehouse building. I’m given a green wristband to dictate my vegetarianism (my friend, an omnivore, is given a different colour) and then we too are ushered inside. 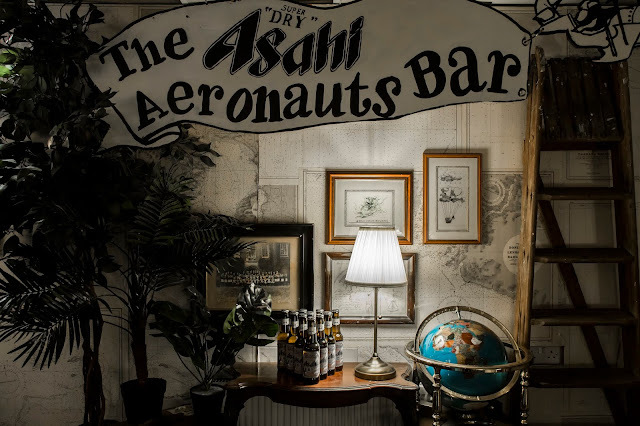 Over the course of the evening, we traverse the world from the comfort of our seats, as a small army of gibberish waffling aeronauts entertain us with dancing, slapstick comedy and mime, and even a couple of silly games to get us out of our seats and mingling with our fellow adventurers. 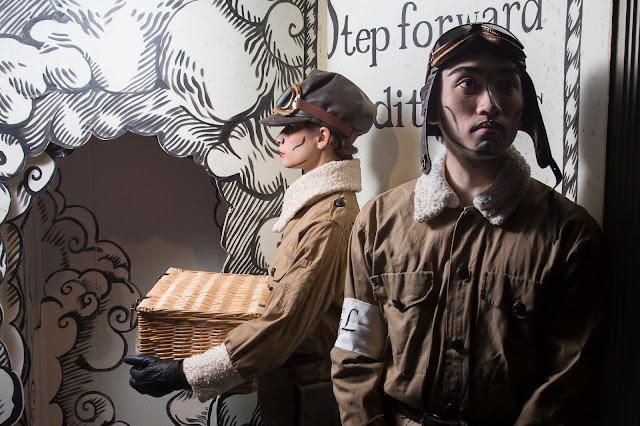 The performers, who double up as waiters, work tirelessly to preserve The Grand Expedition’s madcap foodie fun, and although their flying goggle sporting aeronautical adventurers do occasionally resort to cultural stereotypes in order to convey a sense of place, their committed performances are certainly worthy of plenty of praise. Interspersed with the fun and games, we sample 5 courses of delectable cross continental fodder, served up in increasingly kitschy ways. Our plates burst with flavour, whilst our surroundings shift and evolve, immersing us deeper into the expedition. We’re even called upon to do a bit of DIY food presentation at one point; serving up our own pelmeni dumplings on a bed of borscht ketchup. As a result, we’re soon chatting chummily with our fellow dining companions, as we’re whisked further and further from home. Every mouth-watering course brings something new to the dining experience, with each plate building on the one that came before it, despite drawing on culinary influences from every corner of the world. From the quaint to the downright otherworldly, by the time we come down from our indulgent gastronomic high, our taste buds have clocked some serious air miles! First produced off-Broadway in 2006, [title of show] is a post-modern musical with music and lyrics by Jeff Bowen and a book by Hunter Bell, which documents its own creation in preparation for entry into the 2004 New York Musical Theatre Festival. 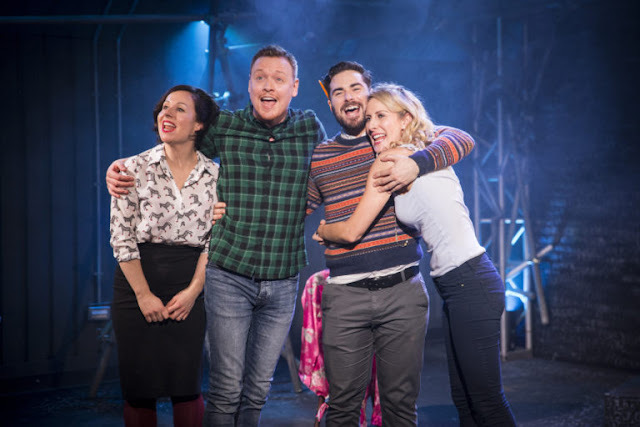 One interesting aspect of [title of show] is that its four central characters are based entirely upon the musical's original cast; creators Jeff Bowen and Hunter Bell, and their collaborators, actors Susan Blackwell and Heidi Blickenstaff. In Director Robert McWhir’s production, actors Jordan Fox, Michael Vinsen, Kirby Hughes, and Natalie Williams take on the roles of Jeff, Hunter, Heidi and Susan. Uniformly charming and extremely funny the quartet of actors bring the autobiographical musical to life remarkably well, transporting the audience back to 2004. 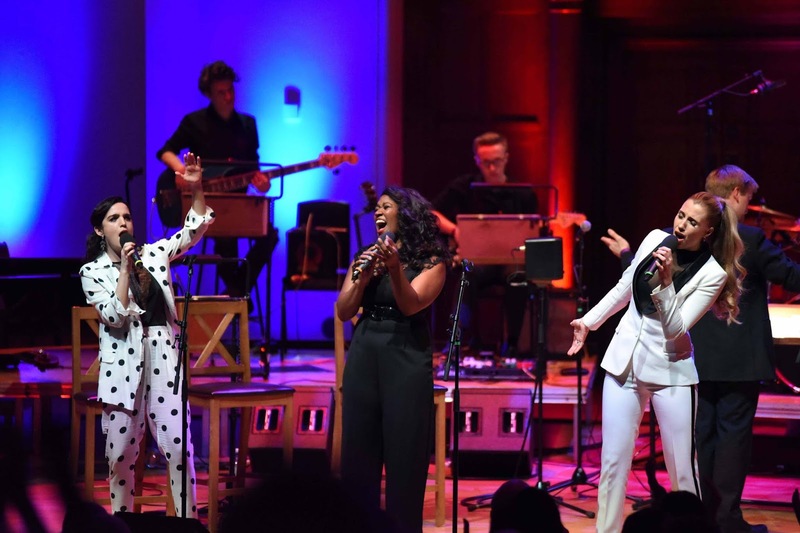 Their onstage chemistry as an ensemble is pitch perfect, rooting the unusual and at times rather unstructured material in reality, and giving the audience something to latch on to as the events of the musical unfold. [title of show] revels in its parred down, stripped back nature, placing its actors centre stage at all times and demanding a constant air of spontaneity from them. Happily, the performers bring it in spades. 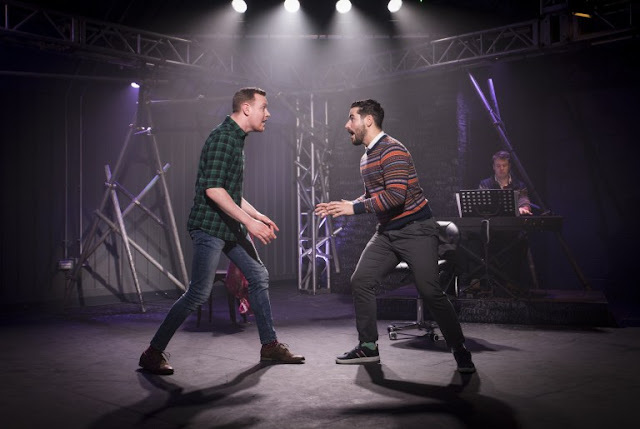 Fox and Vinsen make a snappy duo as the bickering yet brotherly leading men, whilst Hughes and Williams are equally entertaining as self-professed secondary characters Heidi and Susan, whose self-aware second act duet is a musical highlight. A special mention must also go to Associate Musical Director Oli George Rew, as [title of show]’s long suffering musician. This is a meta musical which musical theatre aficionados will love. As well as delivering plenty of laughs, it also offers an insightful glimpse into the process of creating a new musical, from its inception all the way through to opening night… and beyond. On September 11th 2001, one harrowing terrorist attack changed the course of history irreversibly, sending shock waves across the world and ushering in a new era of suspicion, anxiety and insularity. 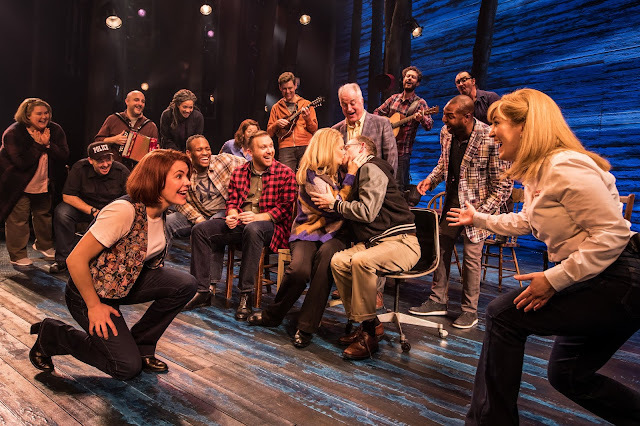 It's in the shadow of that unforgettable day 18 years ago that Irene Sankoff and David Hein's surprisingly jolly musical sensation Come From Away flourishes, proving that even in moments of unimaginable horror, human kindness will prevail. Rarely do such infectiously heart-warming musicals arrive on the West End, drawing audiences in with genuine warmth and heart, and leaving them feeling utterly fulfilled. Come From Away explores what happened when 38 planes from all over the world were forced to land in the small town of Gander, Newfoundland, during the shut down of American airspace following the 9/11 attack. Telling the true stories of the almost 7000 displaced and overwhelmed ‘plane people’ and the Gander natives who welcomed them with open arms, Come From Away is a heartening musical which exemplifies the absolute best of humanity, from its infectiously catchy opening number Welcome To The Rock, right up until the spirited on-stage band plays the audience out at the end. 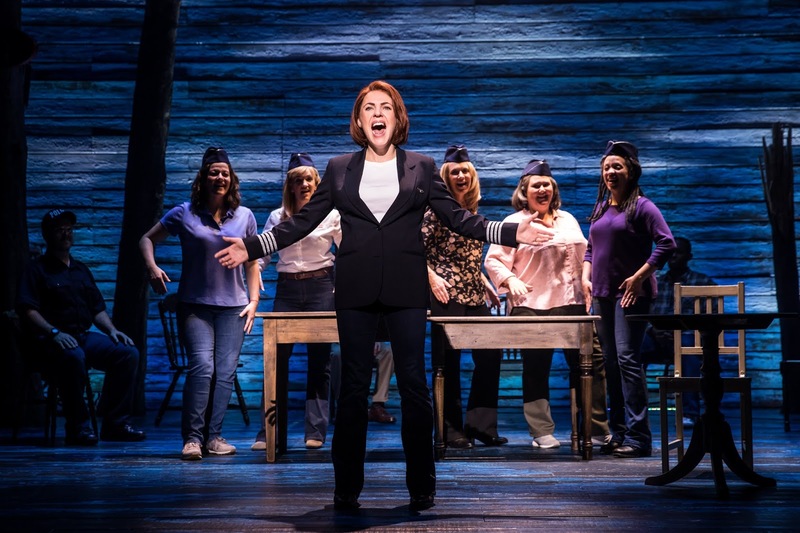 Stitched together by an earthy folk rock score, Come From Away is a patchwork of different stories, told by an incredible ensemble cast. Every character bursts with life, from Gander's gruff yet amicable mayor Claude Elliott, to budding romancers Nick and Diane; a Brit and a Texan who meet whilst trapped on the tarmac at Gander International Airport. Rachel Tucker shines as Beverley Bass, American Airlines’ first female captain, who gives the audience a glimpse into the work of the heroic airline crew rallying together to get people home. Bass' gutsy solo Me and the Sky is just one of the musical's many heart stopping moments. The remarkably frank and human script demonstrates the mushrooming dread felt by Gander’s permanent and temporary dwellers, of course, but the friendships and romances formed in the small town in the days after the 9/11 attack take precedence, and so there’s no shortage of roistering song-and-dance numbers to drive the musical’s message of love and kindness home.